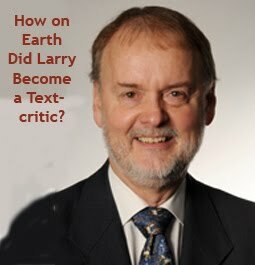 Evangelical Textual Criticism: "How on Earth Did Larry Hurtado Become a Text-Critic?" "How on Earth Did Larry Hurtado Become a Text-Critic?" Some years ago when Larry Hurtado had been invited to the research seminar at Lund university in Sweden, where I did my PhD at the time, I mentioned in advance to the professors and students, that I know Larry Hurtado from my field, New Testament textual criticism. "You know, he is a leading text-critic. What? Is he working in textual criticism? I didn’t know that." The large project in Lund at the time was devoted to exploring the First Hundred Years of Christian Identity and Larry had been invited to speak mainly on early Christian worship in relation to that project. So textual criticism, on this occasion, was left to the coffee time, where it was basically a subject for a chat between Larry and myself. A year ago I was in Oslo, invited to give lectures on textual criticism at Menighetsfakultetet. The professor in charge of the course then mentioned that he had invited Larry Hurtado to participate in a project on prayer and identity. They will host a conference in just a month or so. I told Sandnes, "Yes, I know Larry rather well. You know he is a leading text-critic. What? Is he working in textual criticism? I didn’t know that." So, instead of asking "How on earth did Jesus become God?" (a subject which I leave happily to Richard Bauckham), a more relevant question in light of these reactions, would be, "How on earth did Larry Hurtado become a text-critic?" The above is the opening om my presentation, which you can download and listen to over at the Centre for the Study of Christian Origins website. Incidentally, Larry told me afterwards that he had just had the same reaction from one of the distinguished guests this day – "Did you do work in textual criticism, I didn't know that." There were about seventy attendants in the Martin Hall, at the School of Divinity, Edinburgh University. Alban Books had a small bookstall (on the table to the right), where some titles by Hurtado and the presenters were available. 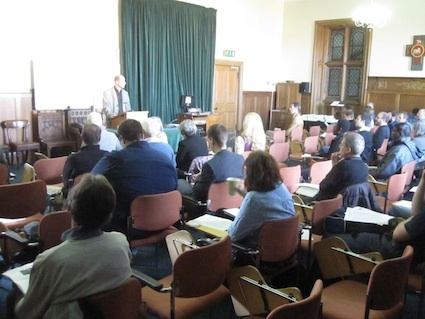 Mark also recorded my presentation on Mark 1:1 in the postgrad seminar, which will soon be posted. The only thing I hate with these audio clips is to hear myself speaking with that typical Swedish accent and pronunciation, sigh. This general ignorance of his TC activity must be due to the fact that he's not an active participant on the ETC blog. Well, he does have an excellent blog of his own where he occasionally discusses manuscript studies and textual criticism. We have linked to it in the right sidebar. Tommy W. wrote, "The only thing I hate with these audio clips is to hear myself speaking with that typical Swedish accent and pronunciation, sigh." But Tommy, that is one thing (among many) that I very much enjoy about listening to you! Tommy, I agree with Mike Holmes. Your accent is awesome and I wish I had it actually :). Excellent resources. Thanks for pointing them out. Mike and Brice – that is really comforting. Not everyone sees the Swedish chef in me (http://www.youtube.com/watch?v=sY_Yf4zz-yo).